Canadian children raised by parents with incomes at the bottom 10 percent can expect to be earning enough as a young adults to place them much higher, above the 40th rung of a 100 rung income ladder, and significantly higher than their American counterparts. To reach a similar point on the income ladder an American child would have to have parents who ranked as high as the 39th percentile. Source: Connolly, Corak, Haeck (2019, Figure 3). Click on image to enlarge. This is one important finding in a study released by the National Bureau of Economic Research, based upon Canadian data my co-authors and I constructed with the cooperation of Statistics Canada. Our research offers a more accurate comparison between these two countries than any cross-country comparisons made in the literature to date: tax-based administrative data, used to define similar measures of income, and coming close to covering the total population of similarly aged young people and their parents. The study is meant to conform to the design of research published in 2014 by Harvard University’s Raj Chetty, Nathan Hendren and their co-authors, who focus on the adult attainments of Americans born between 1980 and 1982 using income tax data from the Internal Revenue Service. There is a good deal of intergenerational income mobility for a large segment of the population in both of these countries, for children raised in families above the bottom fifth and below the top fifth. Family income in this broad middle seems rather loosely related to child outcomes, children having roughly the same chances of moving up as they have of moving down. In this sense, intergenerational mobilty may actually contribute to middle class anxiety, parents not being able to greatly influence their child’s station in life. Source: Connolly, Corak, Haeck (2019, Table 3). Click on image to enlarge. But the children of top 20 percent parents in the United States have an almost 37 percent chance of staying in the top fifth as adults, and face about one-in-ten chance of falling to the bottom fifth. This tilt is also present in Canada, but not as extreme with only 25 out of every 100 children raised in the top experiencing an intergenerational cycle of privilege. A similar pattern exists at the other end of the income distribution, intergenerational cycles of bottom income being more likely in the United States. Rags to riches movement are similar in both countries, but Canadian children from bottom income families have a greater chance of rising at least into the top half of the income distribution. 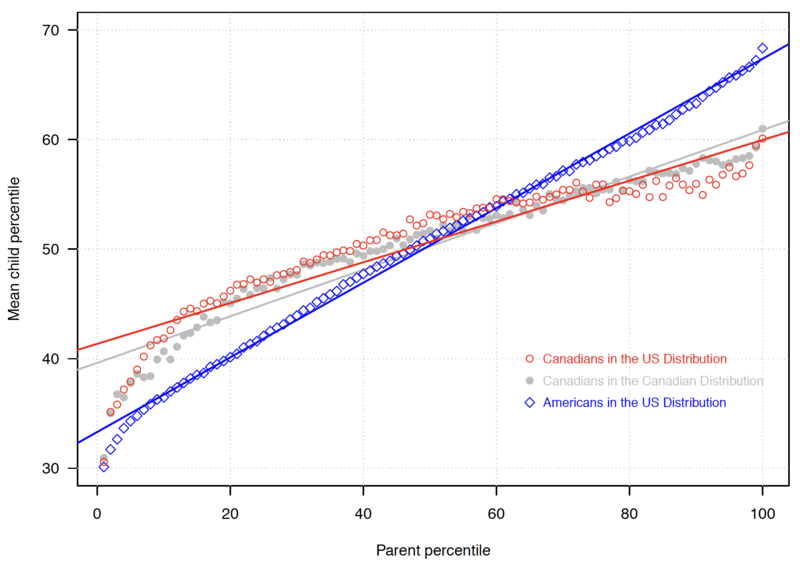 All of these cross-country comparisons, but in particular this last result related to the prospects of low income children, put the “American Dream” in sharp relief, and support the growing evidence that this Dream—if it is defined in terms of income mobility and the opportunity to succeed regardless of family background—is more of a reality in Canada than in the United States. These differences are not simply a question of different values being reflected in different social choices, public opinion polls showing that Americans and Canadians having a common perception the good life . The research documented by the Chetty-Hendren team suggests that the degree of mobility varies significantly within the United States, with some regions showing much more mobility than that recorded even for the most mobile countries. Between country comparisons have more relevance when they are also accompanied by within country comparisons, and our study pursues a between and within country comparison to help understand these national patterns.